If others are to be believed, cows are major contributors to greenhouse gases. Thus, many advocate a reduction in livestock production to combat global warming. Climate change (aka global warming) is a real phenomenon. To date, May 2016 was the hottest month ever recorded. 1 Scientists have also recently attributed the first mammalian extinction (Bramble Cay melomys) to climate change. 2 This is a real serious issue that is changing our world. 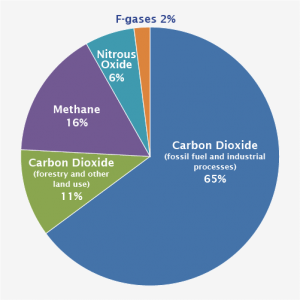 Therefore, who are the main providers of global greenhouse gas emissions? Also, is there any truth in livestock being a major contributor? To first understand how grazing cattle can be considered carbon neutral, a background in climate change science is helpful. For a full explanation on climate change I suggest you visit NASA’s Climate Change website here. One measurement of what is causing the climate to rapidly shift is carbon, or more specifically carbon dioxide (greenhouse gases). Thus, governments around the world have been investigating carbon contributors to the environment. The graph to the right is from the US Environmental Protection Agency, and shows the United States carbon contributors.3 Methane, the major gas attributed to livestock, only contributes 16% to our total global emissions. Within this 16% includes other agriculture activities, biomass burning or other energy sources. According to the EPA, agriculture alone contributes only 9% to the United States total global greenhouse emissions. This directly contradicts popular media that claims agriculture is the #1 contributor to greenhouse gas emissions. The data proves otherwise.The EPA website report can be found here. Of this 9%, a third can be attributed to methane production from cattle or other ruminants (sheep, goats). So roughly you can conclude 3% of total greenhouse emissions from the United States can be attributed to livestock. It is also worth noting the United States produces ~20% of the world’s beef supply. What drew my interest to write about this topic was a recent article I came across. Teague and others recently published an article titled ‘The role of ruminants in reducing agriculture’s carbon footprint in North America’ in the Journal of Soil and Water Conservation.4 In this article, the scientists discuss the impact agriculture has on the environment and global greenhouse emissions. 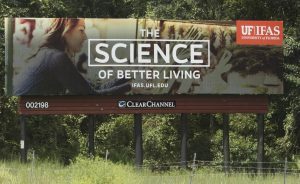 These authors come from many different fields to include: Ecology, Animal Science, Environment and Natural Resources, Engineering, Sustainable Agriculture, and Economics. Tillage of soil and use of fertilizers and biocides that reduce soil microbe populations. Microbes remove carbon from the environment. 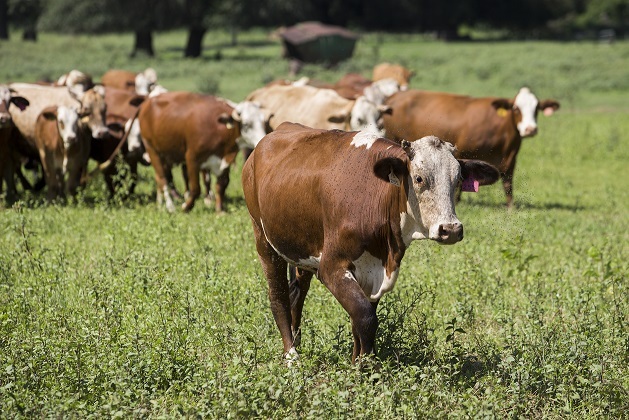 The authors conclude “production of food to meet global demand comes at considerable environmental and social cost.” These scientists state even if all livestock production were to cease, there would be no impact to greenhouse gas emissions. They explain the greenhouse gas emissions from the production of food needed to replace animal protein in diets would be the same (or greater). The prevailing argument is we need to reduce to global supply of livestock to curb their contribution to climate change. However, these scientists argue that livestock production is part of the solution in reducing greenhouse gas emissions and not the problem. Their premise is grazing livestock play a key ecological role in grasslands and savannas. It is worth noting here that bison (ruminants) once numbered over 60 million and ranged throughout most of North America.5 Bison were part of the natural environment (see image to the right of bison’s historical range). Sadly, bison populations were decimated in the 19th century. 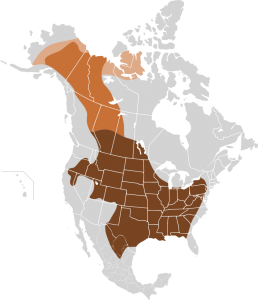 Yet, it can be argued that today’s grazing cattle can now fill that ecological niche. They state when grasslands are properly managed for livestock, they restore and enhance grassland ecosystems. Microbes flourish and populate the soils. All of which increase carbon sequestration. Past evidence has shown that regenerative human management of grassland agroecosystems can create a large carbon sink to curb greenhouse gasses. All this evidence led this diverse group of scientists to conclude that grazing cattle are actually part of the solution to curbing climate change. This is not meant to minimize other issues with livestock production. Things such as deforestation for agriculture, livestock and wildlife conflicts, and other key issues need to be addressed. Creative solutions need to be researched and put into practice. However, the take-home message of this post is grazing livestock are beneficial to grasslands in many ways. We must seek creative solutions as we rapidly approach a population of 10 billion people. We urgently need more research and discussion into sustainable practices to feed so many people. Thankfully, here at the University of Florida, and at other institutes throughout the world, we are working on these important topics. 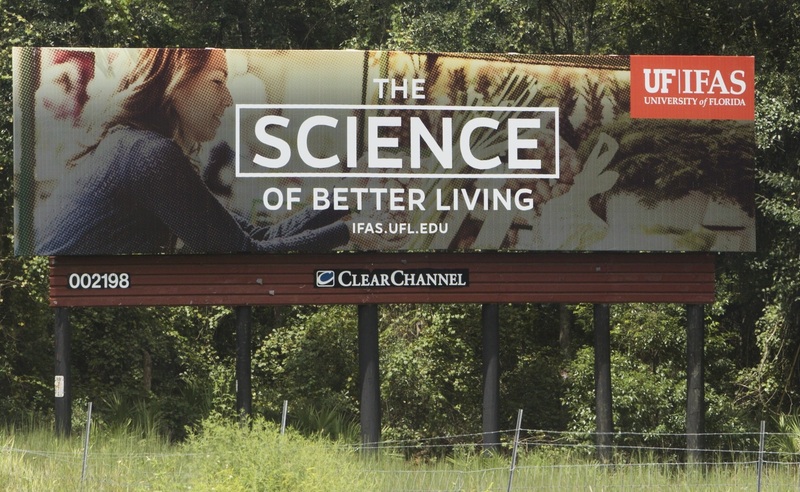 One such project here at UF is the Challenge 2050 project and if interested I suggest you visit their website. R. Teague, S. Apfelbaum, R. Lal, J. Rowntree et al. 2016. The role of ruminants in reducing agricutlure’s carbon footprint in North America. J Soil and Water Conservation 71:156-164. ← Is There Wide Distrust in Science?